Rusty Eye’s eccentric bass player Mr. Rust was interviewed for Music Connection! Published since 1977, Music Connection magazine is a bi-weekly music trade publication catering to the music industry, its loyal fans, and support services. Founded on the principle of bridging the gap between “the street and the elite,” Music Connection has garnered a solid foundation of active readers, and is commonly referred to as “the musicians bible.” This leading music trade magazine caters to the seasoned veteran as well as the fledgling musician, and to the top executive. Music Connection magazine is distributed through a network of newsstands, bookstores, 7-Elevens, AM-PMs, record stores, and musical instrument stores, the readership is over 75,000. Seventy percent of the readership is in Southern California, five percent in Northern California, and the remaining twenty percent throughout every major city in the United States and several foreign countries. 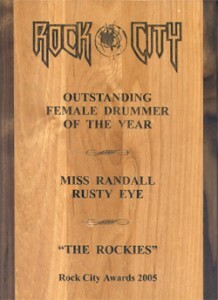 Miss Randall wins the Rock City News Award for OUTSTANDING DRUMMER OF THE YEAR 2005!!! We are grateful for the endless support… THANX TO EVERYONE!! !